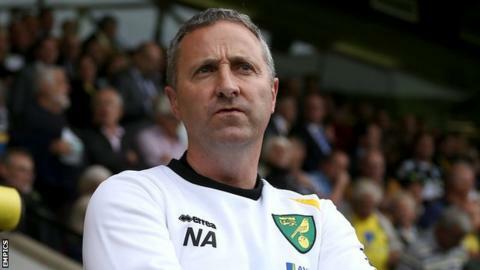 Norwich boss Neil Adams is concerned his side are becoming known for only performing in the second half of games. The Canaries have scored nine goals in the second half and conceded four in the first half of their last three Championship matches. "We've got to be careful we don't get tagged with this," Adams, 48, told BBC Radio Norfolk. "I want to make sure we avoid that tag of being slow starters or a team that can only perform in the second half." Norwich are unbeaten in their last eight games in all competitions and are second in the Championship table. But they had to come from 2-0 down at Cardiff last weekend to win 4-2, endured a tricky spell in the first period at Brentford on Tuesday before going on to win 3-0, and then recovered from another two-goal deficit against Birmingham City on Saturday to take a point. "Admittedly Cardiff was nowhere near [good enough in the first half]," said Adams, whose only defeat this season came on the opening day at Wolves. "Brentford was a lot better. I think people saw Brentford's last 15 minutes of the first half and thought we had a slow start again, which wasn't the case. "And then again Saturday, look at the opening period of the game when we were right out of the traps. But of course it's 2-0 - so we're well aware of that and we need to make sure it doesn't happen too often. "Certainly on Saturday the key word in the build-up was 'complacency', and we weren't complacent. We came out very strongly. The first goal is a fluke and the second one we have to deal with better. "It's not a bad tool to have when you can overturn deficits, but we want to be ahead in games." City face Shrewsbury in the League Cup third round on Tuesday night and Adams hopes to give last season's top scorer Gary Hooper and influential midfielder Jonny Howson their first minutes of the season after injury lay-offs.